This is not goodbye by any means. Just another opening in my life. 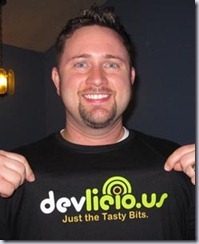 I was recently accepted to blog at Devlicio.us. Devlicio.us is a great community and is full of some top notch folks and I look forward to the opportunity to contribute! GWB has been and continues to be a great community and I plan to continue posting here as well. I will be cross-posting most content here and there. For those of you who subscribe, that will continue to point to here at FerventCoder.com.